Did you know that within our benefice we have a wonderful resource of people who are available to visit others? They are our Lay Pastoral Assistants (LPAs) who have been trained and licensed by our Deanery. 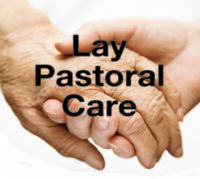 You may be aware of someone who is ill, in hospital, housebound, or who perhaps has recently been bereaved, or of anyone who would really appreciate a visit from one of our LPAs, a Christian group. Please do consider passing their name to Jenny Gollop, our LPA co-coordinator, who will arrange for a visit. LPAs are happy to visit all people, whether they have any faith or none. Please do ask. Caring for one another within our communities through visits, is one way in which we can practically demonstrate the love of Christ. If you know of anyone who would like to be visited, please contact, in the first instance, the LPA coordinator, Jenny Gollop on 01458 223516.